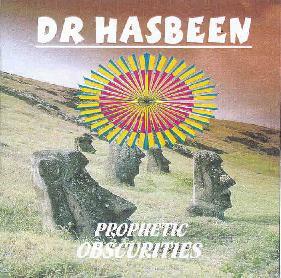 Dr Hasbeen - "Prophetic Obscurities" / "Spirit Of Brock"
Dr. Hasbeen - "Prophetic Obscurities"
Dr Hasbeen - "Spirit of Brock"
Dr Hasbeen - "Prophetic Obscurities"
England's Dr Hasbeen wears it's Hawkwind influences on their collective sleeves and makes no bones about it. Their music is heavy synth-laden Hawk-style spacerock with vocals that sound just like Krel's "Ad Astra". The guitar is prominent and, though not particularly exciting, solos frequently in a trippy psychedelic fashion that makes it work well within the whole of the music. Dr Hasbeen performances have been highly visual events featuring extensive lightshows, dancers, and jugglers. The band was formed in 1995 as the Space Bandits and changed their name to Dr Hasbeen in 1997. Prophetic Obscurities is the third release from the Hasbeen camp and consists of founder Martyn Needham on vocals, guitar, synths, and keyboards, and Daz Fletcher on vocals, guitar, and guitar synth. The band does what they do well though there isn't a lot of variation across the songs. Among the standout tracks is "The Seers Song" and "Meet Thy Maker" which make up one 12-minute track that opens with pulsating, gurgling synths and soon settles into a throbbing groove. Before long it starts to rock out and the rest of the tune is a solid space jam. "Soul Sacrifice" was another track I enjoyed with it's pounding rhythm, wind blowing synths, and freakout guitar. "Curtain Of Time" is a more overtly electronic tune that maintains a steady repeating beat and synth lines while the guitar solos along. Hawkwind fanatics will enjoy this though I'll wager these guys are far more exciting live than on disc. And while they manage to make it succeed I still think the guitar is the main weak spot. It sounds great, but seems to fumble along too much. Three are some great performance photos and news clippings on the Peace Of Mind British spacerock web site. 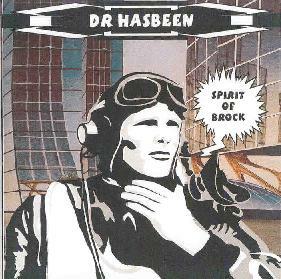 Dr. Hasbeen - "Spirit of Brock"
No, it's not Dave Brock himself at work on this one, but rather one Martyn Needham (of Derby, England) who has 'appropriated' the Hasbeen moniker for himself. From what I've heard, he's also released two earlier CDs, entitled "2125" and "Prophetic Obscurities." On "Spirit of Brock," vocalist/guitarist/synth-master Needham and his cohorts (Daz Fletcher on lead guitar, Sue Annable on drums/vocals, and Jake Billington on bass) quickly crank through six space-rockers very much in the Hawkwind vein. Funky synths and a bit of guitar fanfare kick off "Beyond Control," and although some chant-style vocals chime in eventually, this isn't really a fully-fledged tune. But a nice opening statement nonetheless. Heavier rhythm guitars start off "Mugs of War" with that effects-laden sound that Pressurehed use so often. The problem here is the vocals, bass, and drums are all mixed down well below the twin guitar tracks. "Why Syb" is a tad better in this department, and is a nice astral journey with ebbing-and-flowing synth tones and syrupy vocals offered by Annable. Sequenced electronic pulses lead into "Man's Greatest Enemy," where Fletcher demonstrates his chops on guitar and Needham contributes echoed poetic vocals over the spacey-synth backdrop. Truly the "Spirit of Brock." In fact, the title track follows next, and is a true tribute to the Hawkwind baron. I can't pick out all the lyrics, but there's no doubt who their heroes are. "Mugs of War (Part 2)" bears little resemblance to the earlier track, relying on more layers of pulsating and swirling synths and Fletcher's melodic leads. This is pretty good material, but doesn't stray too far from the time-honored tradition of 70s space rock. Whether Needham's truly a 'hasbeen' or not I can't say, as I'm not certain where he came from. But I'd like to hear more from this quartet anyway, especially since this disc only runs about 23 minutes. And I'm not so happy with the quality of the mix here. The lower-end rhythm section needs to be brought out more, a mistake that Brock himself would never make.